Well that was my Saturday, Sunday, Monday and Tuesday. We were in Cincinnati Saturday at the ATP Masters, which is a prelude to the US Open at Flushing Meadows in a few weeks. We watched both semi-finals. Roger Federer struggled to overcome Leyton Hewitt 6-3, 6-7, 7-6 in bright sunshine. I was surprised to see how pro-Hewitt the crowd were but despite being the better player on the day the Aussie still went down to the masterful Federer. Later in the evening we saw a powerful performance from American James Blake who beat Nikolay Davydenko 6-4, 6-2 in less than an hour. On Sunday Federer claimed his 50th career title when he demolished Blake in the final 6-1, 6-4. The Lindner Family Tennis Center 25 miles outside of Cincinnati is unusual in that it is the only venue outside of the Grand Slams with more than two permanent stadiums. The arena holds around 20,000 and there was plenty of things to do around the courts to occupy the near sold-out crowd in between matches. We also watched the dominant pairing of the Bryan brothers win their doubles semi, but they surprisingly lost their final on Sunday. On the Sunday, we took the opportunity to drive into Kentucky, a state known for its love of horses. 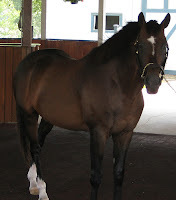 The Kentucky Horse Park is a working stables, equestrian centre, home for retired thoroughbreds and musuem. Situated on 1,200 acres, visitors can amble around the beautiful fields with their freshly painted white fences. The museum celebrates the history of the relationship between horses and humans as well as their role in sports. During the day the Park puts on plenty of activities and shows as well as showcasing some of the legendary champion horses that live on site, such as Cigar (right) considered to be one of greatest living race-horses of all time and my how happy the 27-year old looked in his retirement. Whilst we were there the US Equestrian Federation Pony National Championships were taking place. We sat and watched skinny girls on top of beautiful ponies navigate jumps, whilst Mums fussed over their daughters and fathers discussed the Dow Jones crash. Kentucky Horse Park is about an hour or so drive from Cincinnati and 10 miles from Lexington and is a nice way to spend a day if you have a love of these beautiful creatures. Monday afternoon I was at Wrigley Field and after 5 innings the hot temperatures the midwest has been having finally gave way to terrific thunderstorms. Fortunately I was whooping it up in a box with as much lite beer and hot dogs as you could get down your neck. Chicago, at least half of it anyway, is slowly waking up to the fact that the Cubs may well reach the play-off's for the first time in 4 years. Although with 6 weeks to go in the season, it gives them plenty of time to suffer their familiar slump.